Curious George's Notes from the Hut: Nothin' left for me to do but dance. My dance troupe is opening a studio this week (whee! ), and I'm especially excited to start teaching children's classes later in the year. As I mentioned before, I've been dancing since childhood, so I'm always thrilled to get new dance-related merchandise in stock. If you frequent our dress-up rack, you're already familiar with our wide array of tutus and ballet slipper-style shoes, but we also have books, kits, and lots more for the young dancer in your life. I've had my eye out for potential costumes, books, and props for my future students; here are some true stars! 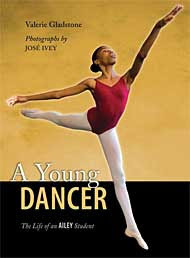 A Young Dancer: The Life of an Ailey Student by Iman Bright and Valerie Gadstone is a great addition to our dance book section because it features the diverse styles of ballet, jazz, West African dance, and modern -- all studied by one dancer! Since its founding in 1958, Alvin Ailey American Dance Theater has been recognized as not only a trailblazing dance company, but also an ambassador of African American culture. This is a look at the life of a student at the Ailey School, featuring behind-the-scenes photographs of Iman in the studio, in performance, and in her hectic non-dance life going to school, swimming, and playing the violin. Another photographic picture book about dance is the brand-new Beautiful Ballerina. 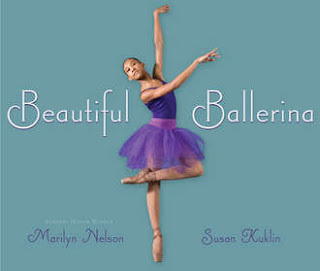 L0vely African American dancers from toddler to teen leap and piroutte their way into your heart through the photography by Susan Kuklin, alongside equally graceful verse by acclaimed poet Marilyn Nelson. Sandra Boynton, master of adorably awkward animals, brings Little Pookie (of What's Wrong, Little Pookie? fame) back to boogie his way into our hearts yet again. 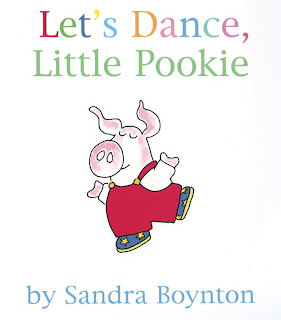 Boyton uses her typically charming rhymes to instruct Little Pookie in the steps of the Little Pookie Shimmy. By the end of this toe-tapping board book, you'll have to get up and shimmy, too! 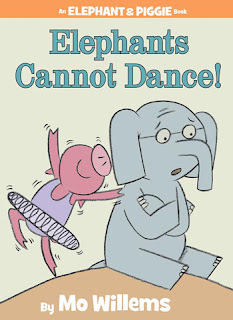 My best friend, librarian, and fellow dancer Bonnie recently visited, and on a tour of the store she was positively appalled to learn I had not yet read the Mo Willems masterpiece Elephants Cannot Dance. After she staged a dramatic reading, I was appropriately ashamed of myself! Poor Gerald valiantly tries to dance, but has come to the depressing conclusion that elephants simply cannot dance. Piggy, in a show of self-satisfied largess, assures Gerald that he can teach this elephant to dance -- but also give up after several tries. However, Gerald, smug Piggy, and the reader are in for a delightful surprise when other characters show up looking for a dance teacher! You may be familiar with American Girl dolls and the accompanying historical fiction novels, but AG also has a whole line of empowering nonfiction! 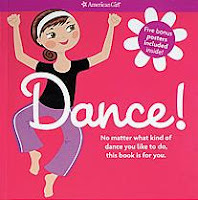 One of my favorites is Dance!, which I'll definitely be adding to my library to share with youngdancers. It's got tips on technique for lots of different dance forms, tricks for battling stage fright, encouragement for getting through tough dance challenges, and best of all, inspiration for letting your unique gifts shine through in your performance. Five motivational posters -- featuring girls of all body shapes and races dancing together! -- rounds out this great book. A good activity for the now-frequent rainy days is Make Your Own Twirly Tutu by ChickenSocks (a division of Klutz -- not that dancers are often klutzy!). 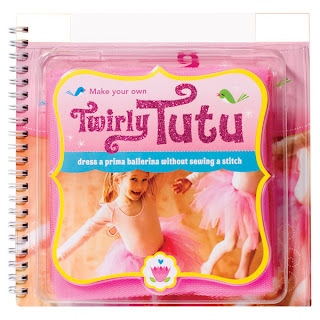 With Klutz's clear directions and provided supplies (and maybe just a little help), little ballerinas can make their very own tutus to twirl about in style! The publisher Barron's, creator of all the awesome "Little Box" kits you've seen around the Hut and in the ChRoom (Little Box of Pirate Treasures and Little Box of Magic Tricks are two favorites! ), has a whole new Box! The Little Box of Ballet will get started on your way to stardom with the Little Book of Ballet Steps and Little Book of Ballet Stories, and all the necessary accouterments to outfit a budding ballerina: tutu, headband, and ballet shoe charm for a bracelet or necklace. 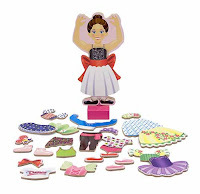 Our activity section boasts a huge company of ballet coloring books and paper dolls. Dover publishes a huge number of activity books starring both adult and child dancers -- some of whom are famous dancers (a la Ginger Rodgers and Fred Astaire) or portraying favorite roles (like "Odette"/"Odile" from Swan Lake or "Sugar Plum Fairy" in The Nutcracker. 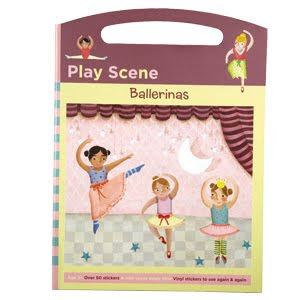 Ballerina paper dolls are the perfect portable ballerina activity for breaks between practices. 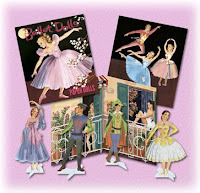 We have I love the new Ballet Paper Dolls by Laughing Elephant, which are reproductions of a set from the 1950s. Two graceful ballerinas come with a full wardrobe of romantic-style tutus, plus their two pas de deux partners and a pretty balcony play scene. Another MudPuppy fave is the age 3+ Ballerina Sticker Play Set, which is the same concept in ColorForm format: vinyl cling stickers stick and restick to the provided scene, or on the fridge, or on the bedroom window, or on the bathroom mirror, or on the car window, or... The possibilities are endless for dress-up fun without any damage to the underlying surface. Whether your little one is taking classes in ballet, jazz, hip-hop, tap, modern, Middle Eastern dance (I'm still hoping for a picture book for that one! ), or just likes to spin around the kitchen floor, one of these dance-themed gifts is sure to inspire her or him to boogie down!